Can I change the format of the inside pages? 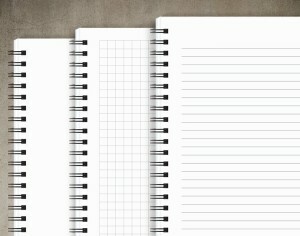 /Notepads and Notebooks /Can I change the format of the inside pages? Our Notebooks and Notepads offer a few different options for the pages. Available options include blank white pages, lined paper, and graph paper. We also allow these to be customized similarly to everything else on the site. Just remember that this is paper we’re printing on, and not a card stock. You can see some examples in our custom options on the details page. These options can be changed and selected at checkout once the cover has been customized. All of the general options for inside pages are printed in black and white. Anything customized will be printed in the colors of the design. What’s the difference between Notebooks and Notepads? Can I add my photos to the cover? What binding options are available? Can I select a different cover option? Can I select a different size?